Big and small companies now advertise on Facebook because it’s cheap and you can reach millions of Nigerians at once. 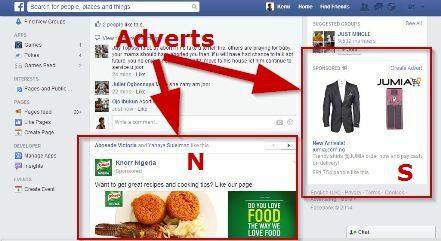 See the red boxes in the image above to know where your advert will be displayed on Facebook. It is bold, conspicuous, obvious and very noticeable. N is called the Newsfeed and S is the Sidebar. Adverts in the newsfeed tend to fare better especially if you have a limited budget. What can you advertise on Facebook?